we have gained immense credibility across domestic market in offering a wide assortment of H Type and C Type Hydraulic Presses that are used for operations like punching, slotting, assembling, deep drawing applications and metal forming. The offered hydraulic presses are manufactured using high grade components and sophisticated technology in line with industry norms. At par the needs of our valuable clients, we provide these hydraulic presses in different sizes and specifications. We are trusted names in offering wide range of Hydraulic Milling Machine to our clients. 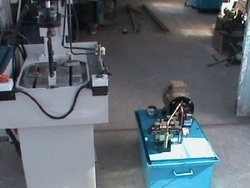 These Hydraulic Milling Machines are made of high quality raw material by our team of experts. Our offered range of Hydraulic Milling Machines are widely used in various industries & can be availed by our esteemed clients at very economical prices. We are counted amongst trusted names in offering wide range of Hydraulic Power Unit. These are designed in compliance with the international industry norms. Efficient in performance, our power units are engineered by skilled engineers, who possess rich expertise in this domain. Keeping in mind the varying requirements of customers, we bring forth these units in multiple models and specifications.